When I was updating my house from plain old white to something a little more lively, I decided to restore the room to a more Victorian look. Rather than commit to one color, I went with a two-tone room. I maintained the trim in white, added white crown molding and added a chair rail. 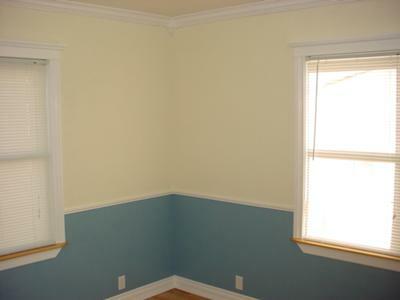 I decided to use a butter yellow color (which to my eye is rather neutral) on the top half of the wall. I liked the feel of it, and it made things easier to match. For the bottom half of the wall I wanted something that wasn’t too “loud”, so I went with the muted blue color. I really enjoy the way the colors compliment each other, separated by the bright white chair rail. I didn’t search too hard for the brand of paint to use. 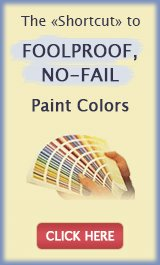 I checked with consumer report and Behr was rated consistently better than any other brand out there, and by a wide margin too. 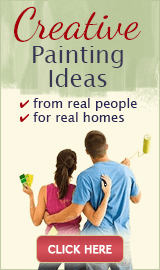 I do a lot of home remodeling, so I waited until there was a discount at Home Depot and ordered the paint from there. It came to $20 per gallon. When I finished the remodel of this room I was impressed with my work. The room turned out better than I had imagined it, and the cost was significantly lower than if I had hired a professional. If I had to go back and do anything a different way, I would have installed the molding first, then painted the walls, then painted the molding. I did it completely backwards and the painting took longer than necessary. My advice for those who want to do the painting themselves: make sure you don’t skimp on supplies, painter’s tape, drop-cloths, etc. There’s nothing more frustrating than trying to paint without the proper tools/equipment. Return to Yellow Paint Colors.